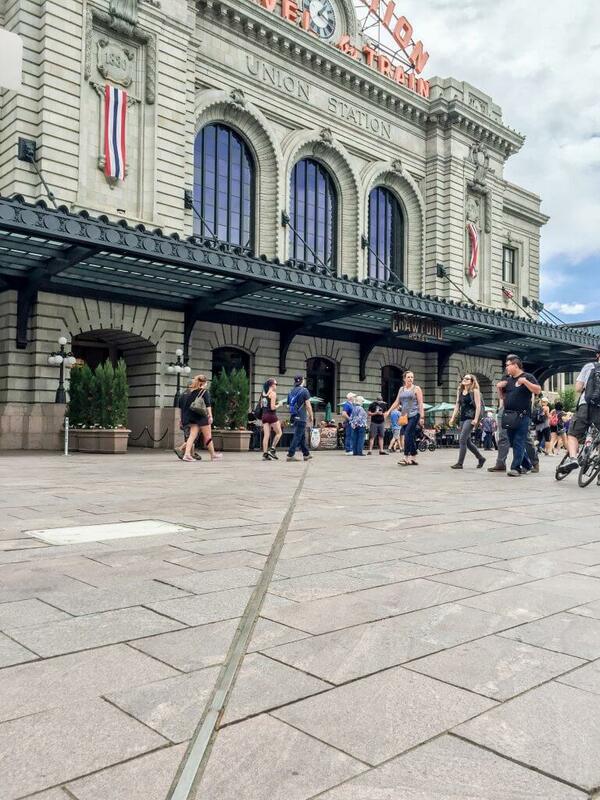 Construction of Denver’s Union Station was completed in 1881 as a hub intended to merge four different railroad stations in the region. The main central building (Great Hall) of the complex, designed in Romanesque Revival style, has remained conceptually unchanged to this day. Local Coloradans will know that from 2012 to 2014 the station was closed for major renovations and upgrades. This $54 million dollar project included an overhaul to the Crawford hotel and improved and expanded retail and public spaces. 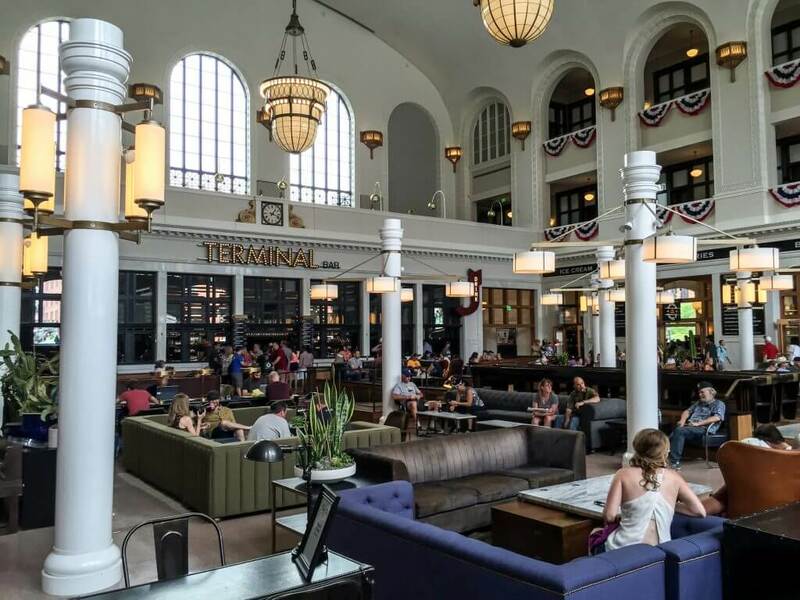 Inside the newly completed Great Hall of Union Station in Denver, CO. The one cool fact that many do not realize about the station is that it sits directly on the 105th meridian West. The line of latitude roughly follows Kalamath Street through the city, passing almost dead center through the station on Wynkoop Plaza. All historical records seem to indicate this was a coincidence and not planned in any way. Ken Schroeppel of the DenverUrbanism blog led the charge to mark this geographical observation in a significant way. As a member of the Union Station Advocates he pushed for a public art installation be incorporated in the landscape design. The stainless steel bar embedded in the plaza surface marks the 105th meridian West. The end-product is the bar you see above directing visitors into the station. I think I walked over it many time before I stumbled upon the significance- but now you don’t have to! 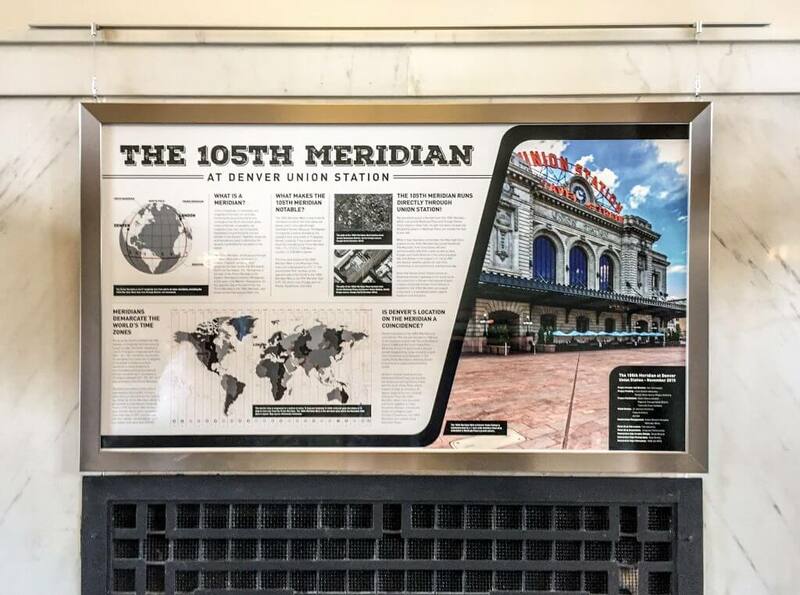 This graphic display in the Union Station lobby explains the 105th Meridian Project. You can read more about this project on Denver Urbanism or visit in person and read the interpretive signage in the vestibule.